I’ve said this a million times before and I will keep saying it: Katie McGarry is one of my auto-buy authors. I began her Thunder Road series last spring. While I liked Nowhere But Here, I didn’t enjoy it as much as I did the books in her Pushing the Limits series. However, the sequel, Walk the Edge, blew me away and is now tied as one of my favorite of Katie McGarry books (review here). I had high expectations for Long Way Home since Chevy and Violet were introduced in the previous Thunder Road novels. I was beyond excited to be able to read their story in Long Way Home. However, I believe this led to me having too high expectations. 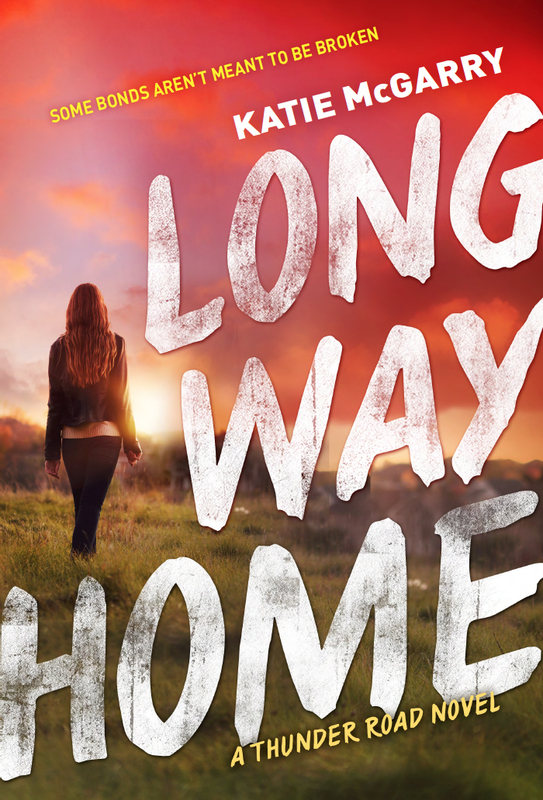 I did end up enjoying Long Way Home, but again like Nowhere But Here, it fell short from her other books. Long Way Home went in a completely different direction than I was expecting when I went into it. Early on in the story Violet and Chevy are kidnapped by the rival motorcycle club, which leads to their slow reconciliation while they deal with the aftermath from this traumatic experience. Due to this, the book is heavy on the motorcycle club information. Violet is being blackmailed into taking down one of the club’s key members whereas Chevy is trying to figure out who is Dad really was in order to help decide his path and whether he wants to join the club or not. I really enjoyed Violet and Chevy’s development of their relationship. They didn’t completely rush back into things and pretend everything was going to be okay. They both realized that the problems they were facing when they broke up were still going to be around and that they needed to figure out who they wanted to be as theirselves before resuming their relationship. Also, I loved how strong of a character Violet is and really appreciated her fight to be viewed as an equal. Overall, I will continue to read Katie McGarry’s future novels. Even though I was disappointed by Violet and Chevy’s story, Long Way Home was still a good read and others will surely love it. I look forward to her next book, which takes place outside of the Thunder Road series. Katie is the author of the full length YA novels, PUSHING THE LIMITS, DARE YOU TO, CRASH INTO YOU, TAKE ME ON, BREAKING THE RULES, NOWHERE BUT HERE, WALK THE EDGE, and LONG WAY HOME and the e-novellas, CROSSING THE LINE and RED AT NIGHT. Her debut YA novel, PUSHING THE LIMITS was a 2012 Goodreads Choice Finalist for YA Fiction, a RT Magazine’s 2012 Reviewer’s Choice Awards Nominee for Young Adult Contemporary Novel, a double Rita Finalist, and a 2013 YALSA Top Ten Teen Pick. DARE YOU TO was also a Goodreads Choice Finalist for YA Fiction and won RT Magazine’s Reviewer’s Choice Best Book Award for Young Adult Contemporary fiction in 2013.